It’s commonly assumed that greater political participation is desirable, but it appears that is not what many voters want. All that many of them want is to not be played for suckers by self-serving politicians and special interests. I would add that the distaste is exacerbated by both cable news and social media. It is worth noting that Hibbing and Thiess-Morse published their book seven years before the Tea Party movement surfaced. The Tea Party seems to overlap at least somewhat with the voters described by H&TM. Based on a study of Tea Party attitudes by Arlie Russell Hochschild, I think some conservative voters’ distaste for government is not as much based on a distaste for political conflict. But definitely it is connected to a fear that government officials are playing them for suckers. For many of them, it also is rooted in a tribalist unhappiness about government accommodations to minorities and immigrants. H&TM find that many voters are more concerned with “process” than “policy.” When presented with individual policy dilemmas, most of them pick a moderate position; however, it’s less about their preference than that they understand little about the issue. People must learn to accept that there is disagreement among Americans on how to resolve issues that are important to them and to accept that there is disagreement on which issues deserve to be on the political agenda in the first place. Elsewhere, we have explained why we believe the current approach to education, with its emphasis on civics facts, volunteer service, and community unity, is wholly unable to show students the realities of political conflict. 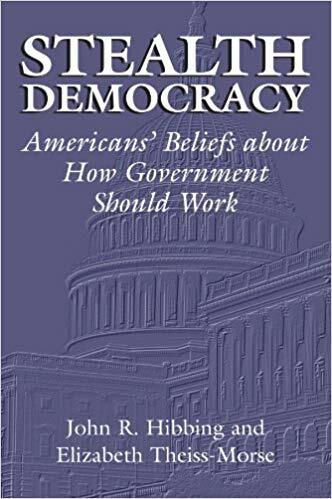 Grossman (1995: 239), for example, calls for civics education in all grades, teaching “from the earliest age the fundamental requirements and responsibilities of citizenship and the importance of fulfilling civic responsibilities.” None of this would help public attitudes toward government in the slightest. Constitutional facts and impassioned pleadings to vote and to be good citizens are not the answer. A political system that people believe deals with relevant issues in a way that is not wired for the benefit of the decision makers is the answer. Thus, exposing students to the range of issue interests of people across the United States and simulations illustrating the challenges of coming to agreement in the face of divided opinion is what we need. The notion that such a curriculum could be perceived as anti-community is truly discouraging. Students will not become good citizens by memorizing lists of what a good citizen does but rather by recognizing that ordinary people have refreshingly different interests, that these interests must be addressed even when they appear tangential, that each issue has an array of possible solutions, and that finding the most appropriate solution requires time, effort, and conflict. To the extent the climate in schools these days encourages avoiding controversial political issues rather than teaching students to be comfortable in dealing with those issues, a great disservice is done to the students and to the democratic process. Students are left with only a saccharin civic side of politics and are thus made more likely to react negatively when in the real world they are exposed to the gritty, barbaric side of politics. Our educational system needs to work harder at teaching students to appreciate the difficulty of making decisions democratically.’ … Getting people more involved in volunteer groups or in participatory settings will not help people to appreciate that with political knowledge and caring come diversity, will not help people to see the need for debate and compromise, and will not make people more tolerant of disagreement on political issues. One thing I like about the above proposal is its focus on difficult national issues, rather than on abstract Constitutional facts, or on mandatory community activity. I question how far the civics lessons from school extend into the voting years of adulthood; nevertheless, it is valuable to impress on kids why government matters, and why there is conflict, using lots of concrete examples. … James Fishkin (1991, 1995) has actually experimented with deliberative opinion polls in the United Kingdom and the United States. The uniting goal of all these ideas is to obtain something approximating a random sample of people who are then provided information and a special opportunity to discuss the topic at hand. As a result, the group will be able to engage in informed deliberation that will be much more valid and much more useful than standard public opinion surveys, since the latter usually entail relatively uninformed opinions and never provide for deliberation among citizens. The contention is that if real decision makers could see informed but otherwise typical people deliberating with each other on the key issues of the day, those decision makers would be better able to act in the real interests of the people (see, esp., Fishkin 1995: 161-76; McCombs and Reynolds 1999). In light of the inability of volunteer groups to improve political capital due, we believe, to the fact that such groups do not help members appreciate and deal with diversity, it is perfectly reasonable to attempt to manufacture situations in which deliberation occurs among people who are not particularly alike. Participation in a discussion of policy issues with a random sample of fellow Americans should be a wonderful way to see the different concerns people hold as well as to see the difficulty of pleasing everyone in the group. The instincts of the people who propose such ideas are correct in the abstract. Unfortunately, in specific practice, getting people to participate in discussions of political issues with people who do not have similar concerns is not a wise move. It is interesting that, in several places in the book, H&TM profess skepticism about the value of “talk sessions”, which is an approach that a number of groups such as Better Angels have recently promoted. At any rate, I think the specific “deliberative opinion poll” approach, as described above, does have flaws. But I envision other, better versions that would have great potential. E.g. scrap the live-interaction part, pay target citizens to participate, and include a mandatory educational component that doesn’t let you participate unless you can accurately and fairly state what the opposing views are. And aggressively publicize the results of such polls. To summarize: a large portion of voters have a deeply negative view of politics and politicians, and their reasons often are not based in reality. A potential remedy would be to help them to appreciate what their government is trying to accomplish, by helping them understand the issues and the conflicting sides of each. Probably, though, a significant number of citizens—I can’t help visualizing them as the “lowest” deciles, in terms of engagement—may be unreachable. And it may be unrealistic to get many voters “involved” in politics – the more realistic aim should simply be to increase their interest in the issues, via scalable approaches that do not require much effort on their part. This would have at least some effects of engendering better behavior from the media and from politicians, thereby reducing cynicism about politics somewhat.